I am a first generation American citizen. Both of my parents were born in Eastern Europe. My mother came to the US with her parents and siblings in the late 1920s, and my father’s family arrived a decade later. Three of my four grandparents were raised in a town located in what is now Romania. The fourth grandparent came from a nearby area. In 1944, the Germans came to that part of Europe and promptly deported almost all of the Jews to the Auschwitz death camp. Most were summarily murdered. My mother’s father was the sixth of nine children. By the time the war ended, both of his parents and all eight of his siblings had been exterminated. Their names are inscribed on the back of his tombstone. Additionally, by 1944, my grandfather himself had seven children, some of whom were already in their 20s. If so, all of his siblings likely had descendants of their own, and his older siblings must have also had grandchildren. They too were all killed. Not one soul remained from all four generations of that entire family. All of this incredible savagery was perpetrated on just one family in one small town. The sum of premeditated evil behind the entire Holocaust seems beyond the parameters of human comprehension or even imagination. My own very life is thus likely attributable to the kindness of the American people and their government who allowed our family to immigrate to these shores. Additionally, once in the US, our family enjoyed full political rights, something that was unknown in Romania. The debt of gratitude I feel toward the USA is unpayable. I was therefore motivated to produce a volume that could possibly contribute to and augment the country’s quality of life. Should this ever occur, the arduous toils of authorship will have been well worth it. I also hope that this volume will serve to acquaint many of my fellow Jews with at least an aspect of their heritage. 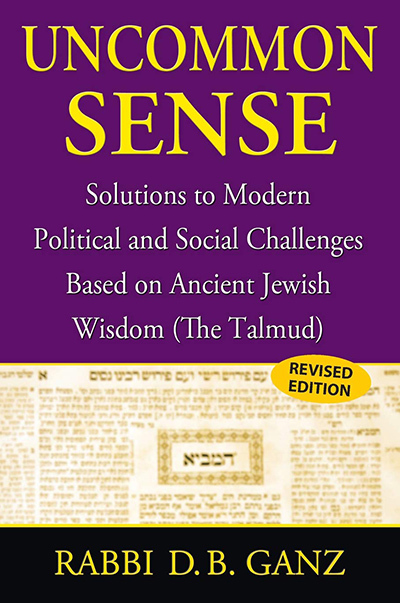 It may come as a surprise to some Jews that the Talmud contains relevant views on topics such as those discussed in this volume. The Talmud is altogether more than an outdated set of rules and regulations or a history book.